FOOTBALL South Normanton v Kimberley. Pictured for South Normanton is Ryan Granger. South Normanton suffered another defeat on the road as they fell to second half goals at one of the pre-season title favourites Blaby and Whetstone Athletic. 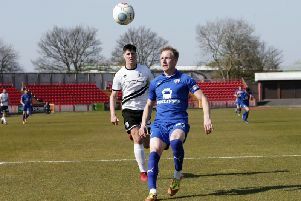 The defeat meant four games without a win for the Shiners which has seen them drop from second to seventh in the EMCL Premier - and another game without scoring. After a cagey start, Steve Smith was adjudged to have tripped Aaron Preston in the box. The striker stepped up and fired the spot kick wide of the post. The second half was much the same but the visitors suffered a blow on the hour when Roberts was forced to leave the field with a deadleg. Granger moved to centre-back and Riley dropped to full-back and it looked to be working until the 78th minute when Preston got free down the left. He fired a shot across Smith, who, despite getting a hand to it, couldn’t keep the effort out. South Normanton chased an equaliser but were caught out on the break. And deep in to injury time Joe Preston broke through and sealed the points for the hosts. Shiners travel to Ashby Ivanhoe on Tuesday in a League Cup replay.